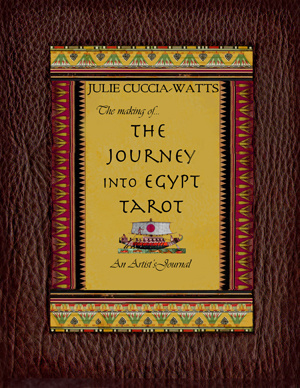 After 4 years of working on it Julie Cuccia-Watts' new deck is finally ready for pre-order. 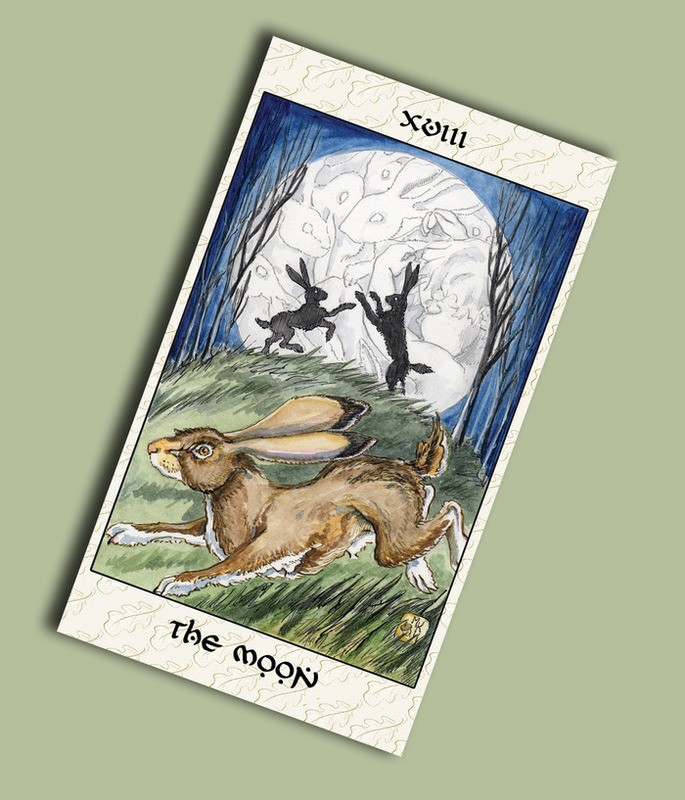 A voyage started with the Blue Moon Tarot published more than a decade ago and continued with the MAAT Tarot , seems to have found a new and interesting culmination (dare I say oasis seen the Egyptian theme?). But behold this is not 'just another pretty Egyptian themed deck' to use the artists own words (and who better to describe her creation to us): "Four years in the making this new deck explores the idea of RealSky Astrology using the ancient 12 month/3 ( 10 day) week calendar of ancient Egypt. Explore ancient Egypt thru the lens of 4 different cultures that once ruled in Egypt. 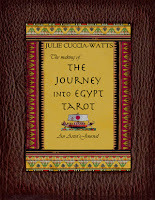 Experience the astrological signs from an Egyptian point of view." So a deck with a mind of it's own and that dares to be (very) different of those around not a clone but an original creation! To find out more about it, see some images, read her post about how some of the images came into being, learn about the system behind the deck and/or yes also to pre-order the deck you can visit her website here. Bertrand Saint-Guillain who back in 2001 created the Triomphes De Paris a back to the roots version of the Tarot de Marseille inspired by Jacques Viéville has also created this deck on the complete opposite of the spectrum where the first one was traditional, this deck looks modern and sharp. Both decks are forming a nice contrast to each other and at the same time a good couple (opposites attract they say...) and dispite their differences there are many aspect that bind them together also, better fitted than many human 'relations' I dare to say! This is a deck with a personality and with living personalities in it, some personal friends of the artist, among who one may easily recognize Enrique Enriquez, as the Magician; Mary Greer as the High Priestess - even the creator of the deck himself is represented as card number 16. This majors only tarot was published as a limited edition of 200 deck and is still available at the artists website here. Almost a year ago I made a post here about the 'I Tarocchi Dell'amore Sacro E Profano' the deck that was inspired by the passion of the artist for his muse D., so overwhelming this desires for her are that almost at the same time as the first, Il Meneghello published the second instalment of this trilogy. 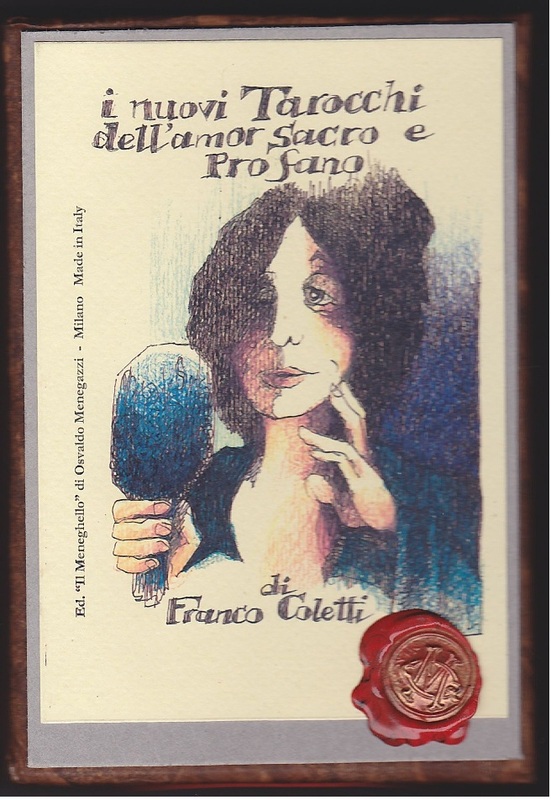 The entitled I Nuovi Tarocchi Dell'amor Sacro e Profano - (aka A New Tarot of Sacred and Profane Love) continues in the same style and vein as the first one, reigning from poetic to a bit...explicit. One can see each card has been executed by a skilled artist who's form of expression lies somewhere between gentle elegance, brute and raw strength, between wild passion and calm rest. Indeed the way I described the used the art is the way I would describe the whole set of 78 cards, the entire Sacred & Profane trilogy and by extension the whole body tarot-creations from Coletti inspired by his feelings for his muse, the always secretive D.
The cards in the major arcana are where the artist poured his own writing into each image while each of the 4 suits is given a literary backbone by: Goethe for coins; the Italian poet, essayist and philosopher Biacomo Leopardi for Wands; Emily Dickinson for the suit of Cups and John Keats for the Swords. As the previous set in this trilogy this one is published in an extremely limited edition of only 12 decks, to learn more about it (and why not see if it is still available and if so order one) you could contact Christina through the Il Meneghello Facebook page or look up the page Arnell Ando has created for this deck here. Fundraiser: Stolen Child Tarot, the 78 CARD DECK! I'm back after some time having taken a break from my blog, during a period I could describe using the following quote: "Double, double toil and trouble" picking up where I stopped to once more share my love of tarot and present some of my finds. Returned and already with some good news, one year after her first passage by the kickstarter site to fund the majors only version of this deck, tarot artiste Monica Knighton is back and this time its for the whole shabam, a full 78 cards edition of the Stolen Child Tarot is awaiting funds to manifest itself.